The Trustmark is step three of our 4-step programme to support the tech industry. Based on our consultations with the industry, academia, and civil society, we have developed Eight Requirements which we believe will help companies tackle the terrorist exploitation of the internet while, respecting human rights. To qualify for use of the Trustmark and membership of Tech Against Terrorism, companies will be asked to agree with all of the above 8 criteria . 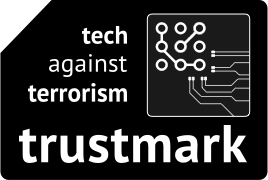 Upon review and acceptance by our team, your organization will then be granted use of the official Tech Against Terrorism Trustmark (inset-below). This signifies your adherence to our requirements of membership.